For accurate machining of structural steels of diameters up to 80 mm, Herkules offers a high-performance notch milling machine. More than 200 notch milling machines have been delivered to satisfied customers all over the world. Excellent damping parameters and outstanding rigidity – these are the main characteristics of our notch milling machines NNF. An almost vibration-free machining is guaranteed. The outstanding quality of each single component manufactured in-house increases the operational life of the machines significantly. 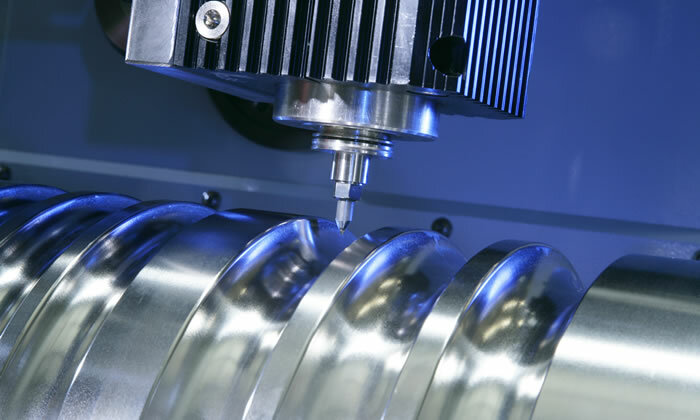 A powerful milling spindle guarantees a strong performance and short machining times. High efficiency thanks to reduced set-up times: the rotating counter bearing base components, which can accommodate four counter bearings with identical or different diameters, are swivelled in as required, allowing for a speedy and accurate change of milling diameters. This is how Herkules significantly reduces set-up times. The design of the Herkules notch milling machine NNF is characterized by high-quality machine components. Headstock, tailstock, the bed and the milling saddle are made of cast iron and machined to the highest precision within the company group. The reinforced Herkules milling saddle allows for the smooth machining of notches with diameters of up to 80 mm. By the help of the specifically developed control KP 20, all kinds of different notch forms can be produced. Based on many years of experience, Herkules adjusts each single machine to the specific needs of the customer. A wide range of Herkules equipment options serves to find the perfect solution for your individual machining task. The machine bed is made of special high-quality cast iron. It is heavily ribbed and vibration damped. The guideways of the saddle consist of pre-mounted linear roller recirculation guides, on which the saddle is guided by the help of recirculating guides. Thanks to this layout, wear on the guideways is practically ruled out. The rear guideways accommodate the tailstock. The workpiece headstock is designed for a long service life – even when performing the heaviest duties. The rotational drive is realized through an infinitely variable frequency controlled AC servo motor. 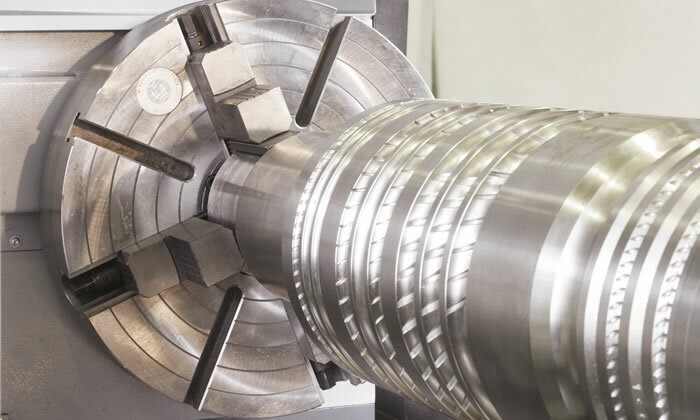 A powerful precision four-jaw chuck is fixed directly to the main spindle with an accommodating cone. A special accommodating thorn is used for roll rings. The tailstock is also of sturdy design and constructed in a robust way. A rack and pinion system is used to move it along the bed. This design allows positioning the tailstock at any required point. Its great advantage is that the centers never need to be moved far out of the tailstock housing. Thus, stability is guaranteed at all times. Feed motions are generated by frequency controlled AC servo motors via pre-mounted recirculating roller linear guides. This design allows a stick-slip-free infeed of even the smallest amounts. 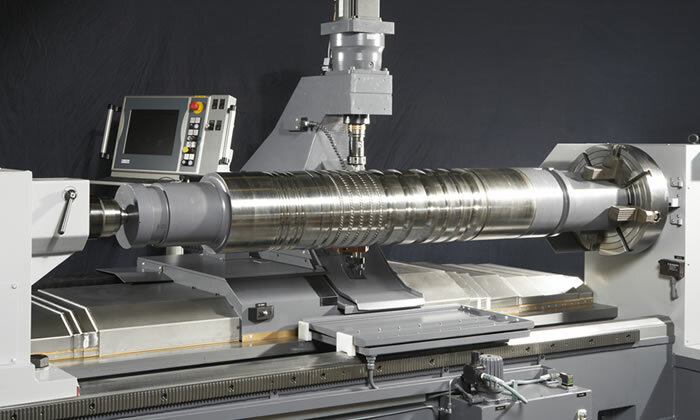 The milling spindle is driven directly by a frequency controlled AC servo motor. It is synchronized electronically with the workpiece drive so that exact spacings and angles of inclination of the notches can be realized. All milling spindles are mounted quickly and accurately without need to remove the robust multiple counter bearing block. The counter bearing supports the milling spindle directly in the work zone. By a simple swivelling motion, four different support positions can be set for different milling diameters. This allows very quick and accurate transition from one milling diameter to another. The counter bearing can be adjusted before or during the milling operation. It enables an ideal adjustment to the milling process. The result: tool costs are reduced. The milling head is perfectly suitable for nominal milling diameters of all known structural steel types of both carbide and conventional material. 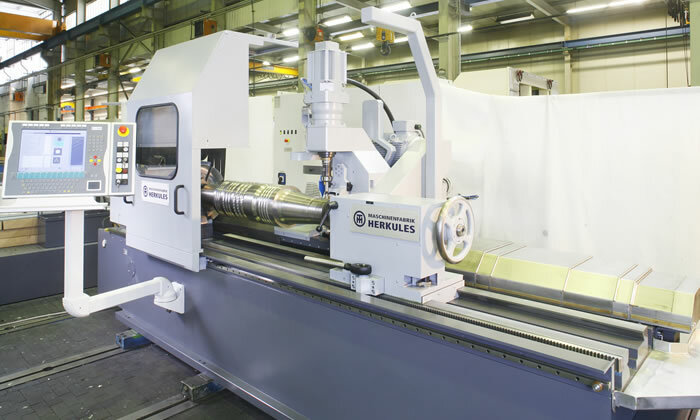 Optionally, Herkules notch milling machines can be equipped with an automatic measuring device – for quick positioning of the milling spindle center at the centerline of the groove, for measuring the depth of notches and for re-locating notches. This measuring device significantly increases the efficiency of the machine. The device is mounted on the milling head and can be automatically swivelled into the working position. It is integrated in the machine; all necessary movements for measuring are realized by the machine axes. The measuring device works automatically and can be activated at any time. The logo milling device mills numbers or letters in the grooves of rod mill rolls or TC rolling rings in order to mark your product as per your specification. The device is integrated in the machine. All necessary movements are realized by the machine axes. All numbers or letters are programmed on the CNC control by entering relevant data on the graphic screen. The notch milling machine NNF is designed to produce excellent milling results for your fields of application. Upon request, we can realize other sizes for you.